Apple vs. Microsoft in the Enterprise compared the companies' very different approaches in delivering a single, specific new product. The market power of a single product can be greatly enhanced when integrated into a collection of products on a platform. This creates more value for users, and is a major reason why the world went Windows. Of course, there were also some dirtier bits, too. Platform Death Match introduced the difficulty of launching a new platform and the work involved in maintaining one. This series looks at the historical march of computing platforms, to sort out why winners won and why losers lost. While the computing environment is always changing, the same basic rules are in effect today, and will shape the future developments between Mac OS X Leopard and Windows Vista. •1990-1995: The Race to Deliver the Next New Platform IBM and Microsoft partner on OS/2. •1990-1995: Hitting the Wall Apple's difficulties in updating the Mac. 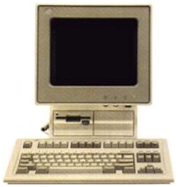 •1990-1995: NeXT, Be, and the Mac PC Contenders to the Mac throne. •1990-1995: The Rise of Windows Apple takes a nap while Microsoft builds an empire. •1990-1995: Apple vs. Microsoft in the Enterprise The forgotten failure of PowerTalk. The reason Apple's Macintosh survived into the 90's--escaping the fate of a variety of other unique platforms that were slaughtered by commodity PCs--was largely because of the tight integration Apple could provide between its hardware and software. Apple wasn't primarily selling RAM chips, a processor, and an OS; instead, Apple was offering a richly engineered and consistent experience. Smaller competitors, from Commodore to Atari, couldn't match the enormous development efforts Apple was investing in its platform. Microsoft employed the same principle of integration in its software offerings. Rather than seeking to build an integrated computer solution like Apple, Microsoft assembled a series of integrated software platforms that created networks of added value for users. Essentially, Microsoft made plans to deliver software, the most valuable asset in Apple's integrated platform, on commodity PC hardware. That put the risk of operational logistics on manufacturers, and allowed Microsoft to deal with a variety of hardware vendors. If one vendor's operations failed, another competitor would emerge to take its place. When IBM, Microsoft's original hardware partner, failed to deliver what the market wanted, Compaq jumped to replace it. Later, other competitors such as Dell emerged; each contributed towards creating a healthy, diverse PC hardware market. That allowed Microsoft to focus on software development and strategies to expand the PC market. Microsoft aggressively sold the Windows PC as a replacement to mainframes, terminals and workstations, installing the PC in entirely new markets that displaced older generations of hardware. That was a market Apple had absolutely no interest in entering; Apple wanted to sell elegant, high margin hardware solutions for an existing market of sophisticated, creatively inclined users; Microsoft, in contrast, targeted new ways to push its software products into any and every possible direction. Microsoft used the slogan "Windows Everywhere" as it planned an invasion to put its software in office copy machines, handheld computers, and various embedded applications, from cars to cash registers to ATMs. While many of Microsoft's ventures failed to materialize, the company did create a huge new market for PCs, which increasingly replaced a range of existing computer systems, including mainframes, minis, dumb terminals, and Unix workstations. 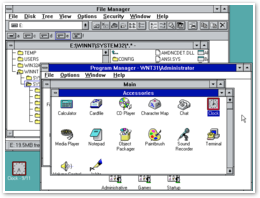 By establishing Windows on commodity hardware and using high volume software sales to finance software operating system development, Microsoft could continue development of Windows while avoiding direct comparison to either the richer user environment of Apple's Mac or to the superior operating system technology offered by Unix workstation vendors. Instead, Microsoft forced Apple and other vendors to compete in the hardware game against its PC partners. 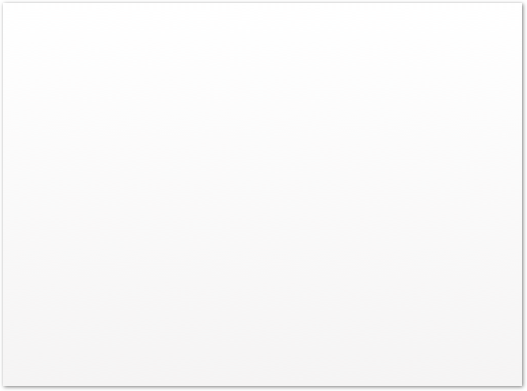 This isolated Windows from direct competition with other software platforms. At the same time, Microsoft signed exclusive bundling agreements with its hardware vendors for Windows software, creating the Windows Price Paradox, a curious situation that enabled the Microsoft to keep its software prices high while forcing other DOS alternatives for the PC to compete at market prices against a product that appeared to be free. Why pay $200 for OS/2 when PCs came with Windows already? Even in retrospect, it is difficult to be fair in evaluating how much of Microsoft's success came from brilliant execution of savvy marketing, how much was based on the greater incompetence of its competitors, and how much resulted merely from a series of fortunate events. However, we do know that significant parts of Microsoft's competitive efforts were merely fraudulent illusions. Microsoft used FUD, a practice made famous by IBM a generation prior, to cast suspicion over existing products in the marketplace in order to destroy their sales. FUD is sometimes confused with criticism; however, the real point of FUD is not negative press in general. FUD is a false negative, designed to create alarm and panic when none is warranted, with the sole purpose of delaying existing sales until a competing product can be delivered, or until the competitive threat is killed. FUD is fraud. FUD is often paired with Vaporware, the placeholder promise of a future product which is described with impressive sounding features that never seem to materialize. Vaporware is sometimes equated with unreleased products; however, the real point of Vaporware is not positive remarks about a future product in general. Vaporware is a false positive, designed to create an illusion of competition when none will ever actually exist, with the sole purpose of delaying existing sales until a competing product can be created, or until the competitive threat is killed. Vaporware is fraud. Between the false negative of FUD and the false positive of Vaporware, Microsoft was able to artfully control markets and defeat competitors who were seeking to sell real products, often without any doing any development work at all. Microsoft used industry analysts as pawns to spread fraudulent information in order to game the market and prevent real competition. Lazy analysts were happy to play along. It gave them simple and obvious ideas to repeat and allowed them to look like informed visionaries without actually do any critical thinking. 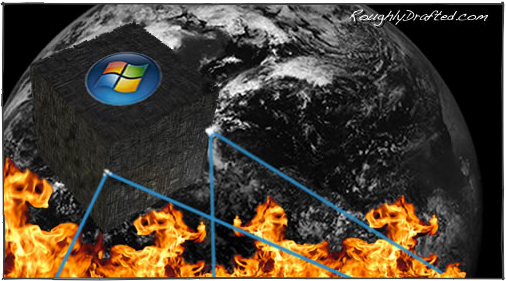 Microsoft was found guilty of manipulating the PC operating system market in the US DOJ's monopoly case. Much of the public evidence collected in the case was not even considered by the court, because the DOJ attempted to present specific charges that only concerned the market for PC operating systems. However, while Microsoft's anti-competitive behavior is no secret, it is also true that the company did actually earn much of its success. It did so by simply planning out effective strategies and working diligently to execute them. In many cases, while Microsoft may have played dirty, the failure of its competitors was often due to incompetence on their part, not simply due to Microsoft's heavy handed hardball with a thick coat of Vaseline. The next installment will present how Microsoft established a series of integrated products that all contributed toward a successful platform, and will compare how Apple is using the same strategies today.